A report by a professor at The Australian National University (“ANU”) has identified approximately 530,000 locations worldwide that would be suitable for pumped hydro energy storage. These sites have a storage potential of approximately 22 million GWh. Research for the ANU report utilized geographic information system (GIS) analysis to find the sites, which are closed-loop and do not include national park land. Each site would have upper and lower reservoirs and a tunnel between them. All of the sites are included on an Australian Renewable Energy Mapping Infrastructure (“AREMI”) website, which can be found in the links below. Pumped-storage works by pumping water to an elevated reservoir during off-peak periods when excess energy is available. That water is then released downhill through turbine generators to generate electricity during high demand/peak load periods. According to Preliminary Monthly Electric Generator Inventory for January 2019, the EIA reports that there is 21,643.3 MW of hydroelectric pumped storage capacity in the United States, just a small fraction of what may be available for construction worldwide. How valuable are zero-emissions credits (ZECs) to nuclear power plants in Illinois? Without them, operating costs at five of the state’s six nuclear plants run close to wholesale power prices, according to an S&P Global Market Intelligence cost model. In 2017, Clinton Power Station and Quad Cities Generating Station both began receiving ZECs from a new state law passed in late 2016, was challenged, and was upheld in Federal Court. 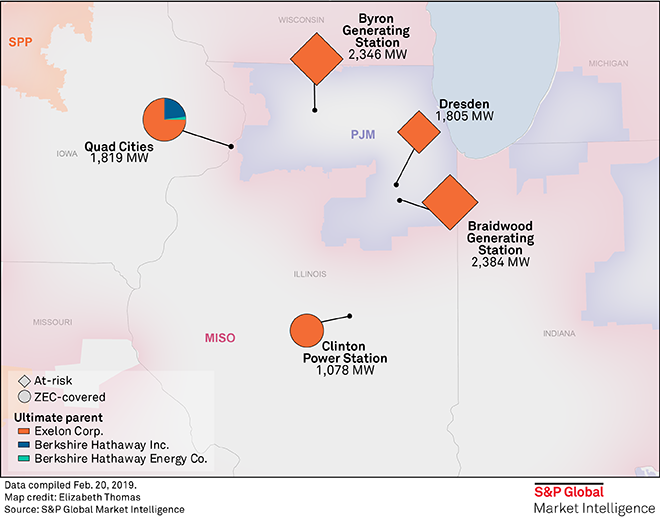 Prior to receiving the credits, valued at $16.50 per megawatt-hour, the Clinton plant saw operating expenses reach as high as 92.3% of wholesale electricity prices, while Quad Cities expenses topped 89.2%. With the ZECs in place, operating costs as a percentage of wholesale power prices have declined to 55.4% for Clinton and 59.8% for Quad Cities. Operating costs continue to burden Braidwood Generating Station, Byron Generating Station, and Dresden Generating Station, none of which receive any ZEC revenue, and could lead to an early retirement. In the company’s annual U.S. Securities and Exchange Commission filing on February 8, 2019, Exelon Corporation stated that its Braidwood Generating Station, Byron Generating Station, and Dresden Generating Station are, “showing increased signs of economic distress…in a market that does not currently compensate them for their unique contribution to grid resiliency and their ability to produce large amounts of energy without carbon and air pollution.” The company went on to say that, “the May 2018 PJM capacity auction for the 2021-2022 planning year resulted in the largest volume of nuclear capacity ever not selected in the auction, including all of Dresden, and portions of Byron and Braidwood.” In 2018, Braidwood saw operations and maintenance costs reach 80.7% of wholesale electricity prices, while Byron hit 82.4%, and Dresden 85.1%. S&P Global Market Intelligence. (March 5, 2019). Note: S&P Global Market Intelligence data and image referenced from March 5, 2019 article, “Operating costs at 3 ‘at-risk’ Exelon nukes run close to power prices.” Market Intelligence is a subscription-based service and a link is not available. According to S&P Global Market Intelligence (“S&P”), the U.S. power grid is expected to add 49,420 MW of generation capacity in 2019, while 8,597 MW of capacity is expected to be retired. 68% of the capacity to be retired, is coal plants, the largest of which will be the 2,250 MW Navajo Generating Station in Arizona. Wind power makes up the largest share of capacity additions, with 22,447 MW expected, or 45% of planned 2019 additions, led by the 500 MW Goodnight Wind Energy Plant in Texas. Natural gas will account for 28% of planned additions and solar will total 22%. The U.S. Energy Information Administration (“EIA”) has predicted a much lower number for 2019 capacity additions, however still expects there to be a net gain in total U.S. generating capacity. According to January EIA data, the US will add 23,700 MW of generating capacity in 2019. This number is significantly less than S&P has forecasted. The EIA assumes a similar amount of capacity retirements, at 8,300 MW. Of the EIA’s expected additions, 46% will be wind, 34% natural gas, and 18% solar. Note: S&P Global Market Intelligence data referenced from January 18, 2019 article, “US grid expected to add a net 40,800 MW of generating capacity in 2019.” Market Intelligence is a subscription-based service and a link is not available. The New Jersey Board of Public Utilities has rejected EDF Renewables’ application for a new offshore wind farm near Atlantic City, questioning its high cost and economic benefits. EDF Renewables submitted the application, which called for MHI Vestas Offshore to supply three V164 8.3 MW turbines for the Nautilus Offshore Wind Project, in September. The project was to be constructed in state waters off the coast of New Jersey. The Nautilus Offshore Wind Project would have been the second operational offshore wind project in the U.S, and EDF Renewables was hopeful for a 2020 in service date. EDF Renewables has since unveiled a new proposal for an offshore wind project in partnership with Shell New Energies. The significant growth of renewable energy generation has made it a challenge to effectively integrate into markets across the US. The inherent variability of wind and solar generation has led to wide, and fast swings in wholesale electricity prices due to supply and demand imbalances. According to a report by the Lawrence Berkeley National Laboratory (LBNL), these imbalances could become much more frequent as renewable generation penetration continues to grow. Grid operators will need to find adequate ways to respond and neutralize this volatility.